Massimiliano Allegri is unsure whether to start Paulo Dybala or Moise Kean against Ajax as the Juventus boss considers how best to replace Mario Mandzukic. The experienced Mandzukic, a starter in the 1-1 draw in Amsterdam, will miss the second leg of the Champions League quarter-final with a knee problem. Defender Giorgio Chiellini is also missing from the squad after failing to overcome a calf issue, but Allegri's key selection issue is over who to select in the forwards. Teenage striker Kean enhanced his case to join Cristiano Ronaldo and Federico Bernardeschi in a front three when he netted his sixth goal in as many games for club and country in the Serie A loss to SPAL. Dybala's form is less convincing, but the 25-year-old will captain the side in Chiellini's absence if he starts in Turin. "I still need to decide who starts in attack," Allegri said at Monday's pre-match news conference. "It could be Dybala or Kean, or neither of them. If one of Kean or Dybala plays then one of [Mattia] De Sciglio or [Joao] Cancelo will be left out. "It depends on what I decide to go with tomorrow night. If Dybala plays then he will wear the captain's armband, otherwise it will be [Leonardo] Bonucci. "Mandzukic has a problem with his knee and has struggled to train at 100 per cent since the AC Milan match [on April 6]. "These games will be better suited to players who are in their best condition, because they have to give absolutely everything." Ajax have fitness concerns of their own, with star midfielder Frenkie de Jong no guarantee to play as he nurses a hamstring issue. "If De Jong plays tomorrow night then we need to put pressure on him," the Italian said. "But we need to win tomorrow and qualify for the next round regardless whether he plays or not. It will be a physical game. "To counteract their play we need to be technically sound and we'll have to play better than we did in the first game." 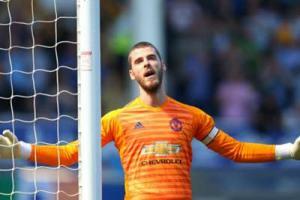 David de Gea has had a difficult few weeks for Manchester United, but Ole Gunnar Solskjaer still has faith in him.